Come Halloween our neighborhood went NUTS. Living on the corner lot at one of the 2 entries to the subdivision we saw so many kids and were often their first stop. They weren’t tired yet and all were so excited. We’d get the loudest and most enthusiastic “trick or treats” I’ve ever heard in my entire life. Now we didn’t have a ton of money. I was in school and that and we didn’t struggle but being in college will always = broke college student. We made sure to have enough candy for every child that walked up to our door, even if that meant tightening the purse strings in another area. Because that’s what you do sometimes. You think of others. So when I heard about people getting upset that “poor kids” were coming to trick or treat in their neighborhoods this year, I got really, really upset. As a young, struggling college student I had no problems giving candy to any kids (except ones that came to my door smoking. If you’re old enough to smoke you can hit the bricks, kid!) and I never, ever wondered what part of town they came from. I just knew that my area was safe for Trick or Treating and I was so excited to be right in the middle of it and sharing in the joy of so many little faces! I know that fall technically starts in September but Halloween has always felt like the beginning of fall to me. 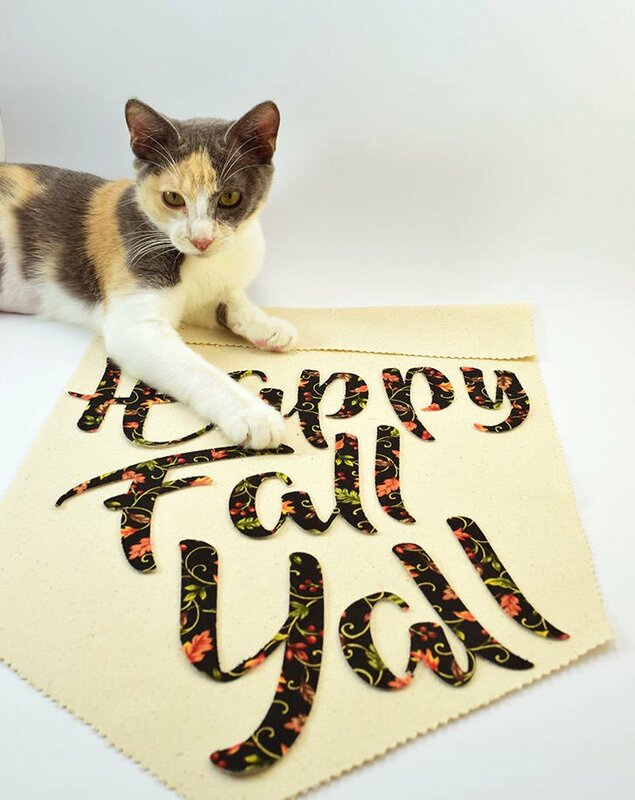 So with the celebration just past us I decided to get into the fall decor with gusto and made a twangy and super simple “Happy Fall Y’all” banner over at Mom Spark. It’s a fun filled tutorial mostly because I had lots of pet assistance in its creation :) Now aren’t they cute? Go see how we made this business over here!